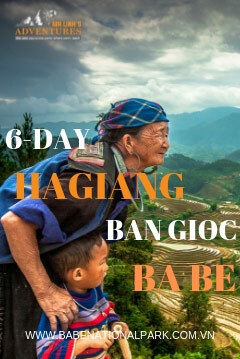 This tour takes you to the most stupendous region of Vietnam, visiting the markets of ethnic people, the mountains of the Black H'mong of Dong Van and Ma Pi Leng Pass, as well as the magical Ba Be Lake, all while travelling along spectacular mountain roads. This tour will take you to some of the most incredible sites in Northern Vietnam, a wild and beautiful region full of limestone peaks, black granite needles (the locals call them “stone forests”), dizzying canyons and limitless panoramas. You will get to discover the culture of the local Black H’mong, where the men are remarkably elegant, dressed in black, with a beret, a remnant of their history as great allies of the French. 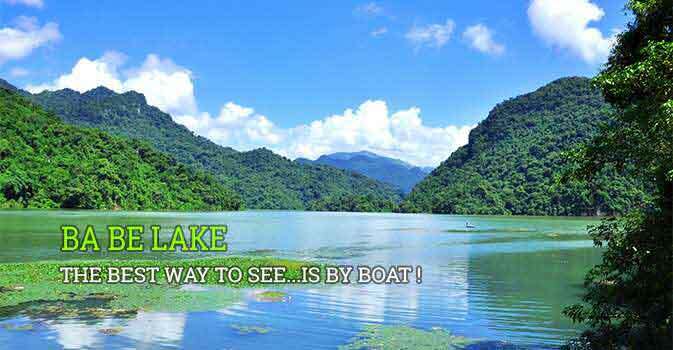 Also on the itinerary is the sprawling Ba Be Lake in Ba Be National Park where you can enjoy the rich natural surroundings and meet the local Tay communities. This journey through the north-east of Vietnam highlights the immense beauty of Halong Bay, Ba Be Lake and the surrounding areas. You will spend five days travelling across land and sea, visiting waterfalls and forests and meeting local people. The signature hike of Ba Be National Park threads its way along the spine of the Pia Booc Range, traversing passes, alpine lakes, and featuring intimate glimpses of iconic craggy summits. You will get to experience boating on the river, hiking through the forest, staying with two different ethnic families, cooking traditional food, trekking in the mountains, kayaking in the lake, and visiting a local school. This is without a doubt a trip filled with action and excitement that lets you enjoy both natural beauty and authentic experiences meeting local people. If you are looking for an adventurous mountain trip packed with trekking and outdoor activities, this five-day trip in Sapa and Ba Be is the perfect tour for you. 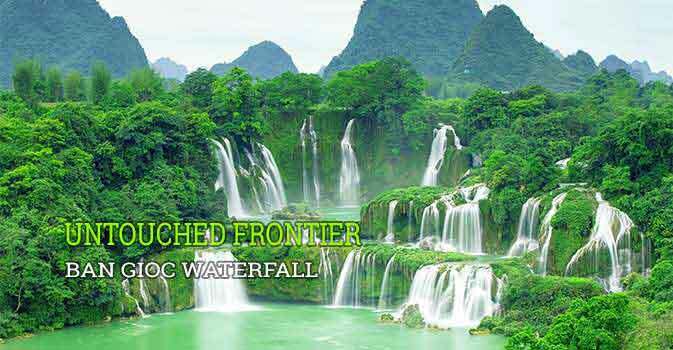 The rich and diverse landscapes combine mountains, rice paddies, lakes, rivers, waterfalls and caves giving you plenty of options for exploration. As well as the great range of activities on offer you will also develop your understanding of the rich varieties of cultures in Vietnam as you visit many different local villages. The soaring, rocky mountains and extensive, sweeping valleys in the north of Vietnam inspire a feeling of wonder in all those who lay eyes on the immense landscapes. You will follow the mountain roads between Sapa, Bac Ha and Ha Giang witnessing the incredible scenery unfolding around every corner. As you travel across the region, you will visit the colourful and diverse villages belonging the many different ethnic minority groups in Vietnam. This tour takes you into the heart of northern culture, travelling across vast landscapes to lively and colourful ethnic markets. The north of Vietnam is famed for its sweeping panoramas of limestone mountain ranges and cascades of terraced rice paddies. This tour is perfect for those who love to get off the beaten track to discover unspoilt nature and culture. 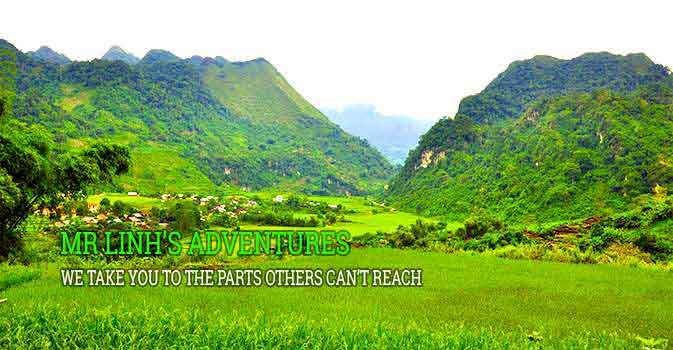 This Ha Giang tour will take you through the awe-inspiring panoramas of Ha Giang and Dong Van, travelling along the mountain hugging Ma Pi Leng Pass and through the valleys. You will journey through the sprawling lands of tea plantations, the stone forests of the Dong Van Plateau and into the ethnic minority communities to stay with local people and explore the fascinating markets. This excursion will take you to from the karst-studded Lan Ha Bay to the stunning Cat Ba Island and finally to the natural haven of Ba Be National Park. As well as taking in some of the most incredible areas in the north of Vietnam, this action-packed trip is full of unforgettable experiences: cruising on a traditional wooden sailboat, hiking through a pristine forest, staying with two different local families, discovering caves system and kayaking. 3 different caves, dry cave Hua Ma, the tunnel of Puong Cave and the river cave Lo Mo. On top of these caves, you’ll also visit national parks and spend your nights in ethnic village homestays. Although there are several huge caves in Central Vietnam, Lo Mo Cave is a major new discovery in the north and another great reason to visit Ba Be National Park, an area of limestone karst mountains surrounding spectacular lakes. This cave is yet to be documented by geologists and is sure to bring out your inner explorer. The isolated regions of the far north of Vietnam have retained a wild beauty and rugged charm that have been lost in many areas. This ultimate experience in the north of Vietnam will take you into the heart of the countryside to discover the incredible landscapes and ethnic minority communities. You will visit many remote areas of unspoilt beauty, taking in the incredible vistas along the way. 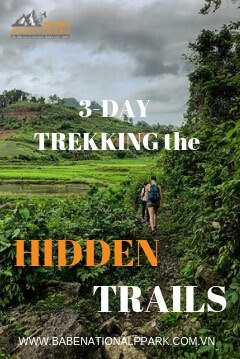 This adventure trek takes you into the remote jungle on the western side of Ba Be National Park. 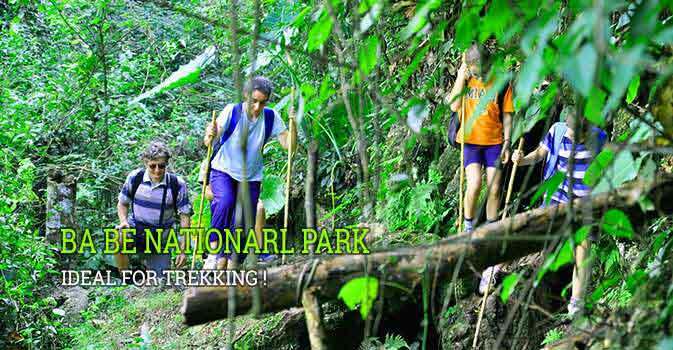 You will trek into the thick jungle to discover the sheer, natural beauty of Ba Be Park. Whilst exploring the park, you will be able to meet the local people living and farming here as you trek to some of the ethnic minority villages. The trip will be topped off with a boat trip and cave exploration. This action-packed trip is perfect for those with a keen sense of adventure and a good level of fitness. This is your chance to experience Ba Be National Park in a whole new way. This tour will take you into the lush tropical jungles of Ba Be where you will spend one night sleeping in a jungle hammock. There is nothing like sleeping outdoors to really connect you with nature. You will also spend two nights in a traditional style wooden stilt house at Mr Linh's Homestay and explore the Ba Be Lake by boat and kayak. 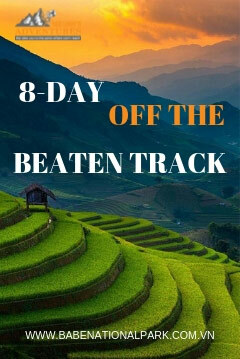 On this 10-day walking tour of northern Vietnam, you will visit the mountainous regions near the Chinese border. You will sweep along mountain passes and descend into beautiful valleys, visiting local markets and ethnic minority communities along the way. This tour is bound to fill you with a new found wonder of northern Vietnam and it's unique landscapes and cultures.